In the late seventies to early eighties, Ralph and Edna decided they needed to down size their operation, so they planned on planting a small field of blueberries. To their surprise, the people in the community and surrounding areas quite enjoyed the berries. The interest in pick your own blueberries was so strong that they decided to expand the small plot into five acres. 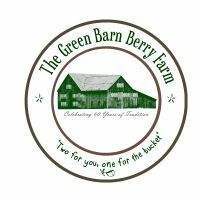 Currently, the farm is owned and operated by the second, third, and even fourth generations. Robyn, the youngest grand-daughter of Ralph and Edna, along with her husband and three children live on the farm. They have been able to expand the business back to its former glory. Since moving here seven years ago, they have added 6 acres of strawberries, another acre of blueberries, plus a little over an acre of raspberries. None of which could have been possible without the help and guidance of her father and uncle, Sam and Carl Styer. It truly is a family run business.